There are certain events in history that are momentous enough to make you remember where you were at the time. 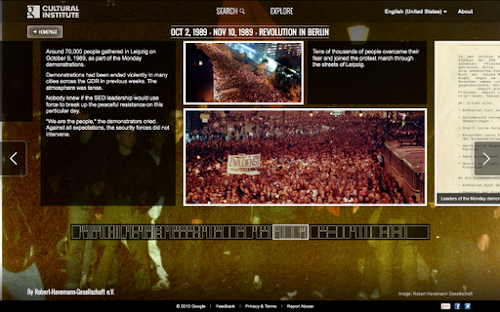 This Friday is the 23rd anniversary of one of those moments—the fall of the Berlin Wall on November 9, 1989. 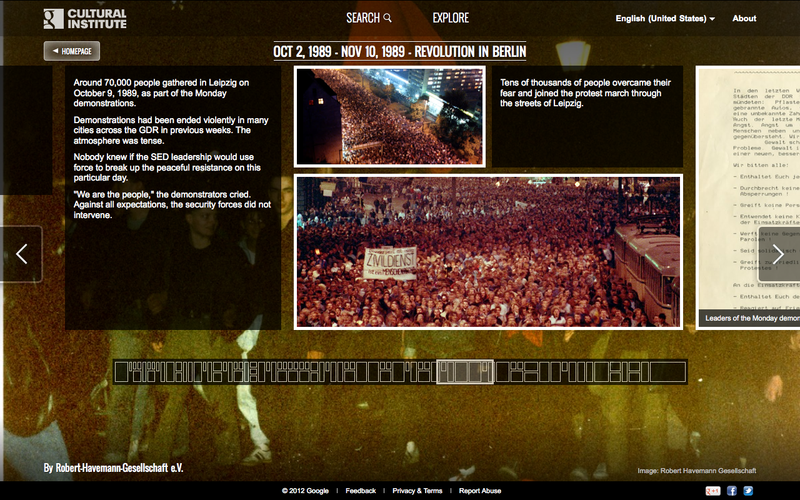 To mark this turning point in history, we’re releasing a collection of online exhibitions under the theme of The Fall of the Iron Curtain. Partners, including The DDR Museum in Berlin, Polish History Museum, Romanian broadcaster TVR and Getty Images, have created 13 exhibitions containing documents, videos and photos telling the stories behind how events unfolded. Independent historians have also contributed their expertise. For example, Niall Ferguson, professor of history at Harvard University, provides video commentary on events as part of his exhibition The Fall of the Wall: Revelation, not Revolution. The Fall of the Iron Curtain is the latest chapter in the work of the Google Cultural Institute, following the launch last month of 42 online historical exhibitions telling the stories behind major events of the last century. You can explore all the exhibitions on www.google.com/culturalinstitute and follow us on our Google+ page. If you’re a partner interested in working with the Google Cultural Institute to turn your archives into online exhibitions, we’d love to hear from you—please fill out this form. This entry was posted on Thursday, November 8, 2012 at 1:04 AM and is filed under Cultural Institute. You can follow any responses to this entry through the RSS 2.0. You can leave a response. Not snakes on a plane. Socks…on a car.